I love this graphic that appeared on The Daily Show with Jon Stewart on July 14th, 2008. It really depicts what is happening in the Republican camp. The stance seems to be that if we ignore the problems, deny the problems, and convince ourselves there never was anything we did wrong then things will get better and we won't be held accountable for them. 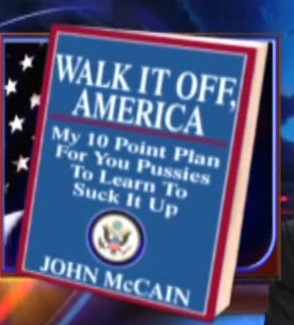 It seems like Bush and McCain need to go over some AA coursework. The first step in fixing a problem is admitting there is one. Its ok, there is a plan B. If there is no way to make a problem vanish then we make it look like its not a problem. Recently Bush made a statement saying that Americans are in control of what they spend and the rising gas costs are only helping America because its reducing the amount of driving. Seriously? I guess maybe in his world this is true because he hasn't admitted that there is a problem in the economy so he can't see that no one can afford anything. Jon Stewart put it best by extending this stance and saying that the collapsing mortgage industry is good because its getting Americans to live outside. People that have known me for a while know that I have been a very strong Republican primarily because of the moral aspect of things but I'm now realizing that the moral card is only played by republicans to get votes. They really aren't doing anything good for morals but, actually, are setting an extremely corrupt moral example in the name of morals. It may be true that the democratic party has no morals either but if I have a choice between bad morals or bad morals in the name of good morals then ill just take the plain old bad morals. Its also true that I am struggling with Obama's vote for FISA and I'd much rather see Ron Paul in office but when I come back to reality Obama is the only real option against McCain and I think the biggest part of this election is stopping America from continuing this path to destruction.